Supply Single Foot Pedal Impulse Heat Sealer Machine For Make Bag From Zhejiang Tianyu industry Co. Ltd Factory.That Sealing Plastic Poly Bag Film Industrial Packaging Machine from made in china Factory. 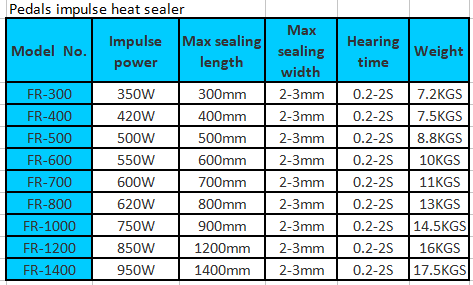 Single Foot Pedal Impulse Heat Sealer Machine That Sealing Plastic Poly Bag Film Industrial Packaging Machine is provides durable seals for almost any sealable films and bags. Works with Polyethylene (PE), Polypropylene (PP), Polyvinylchloride (PVC), Polyurenthane, Polyolefin, Pliofilm, Kel-F, Polyflex, Mylar, P.V.A., Tivac, Saran, Nylo and all other sealable films, bags.Zhejiang Tianyu industry Co. Ltd specializes in design, production, sales and export impulse heat sealer，Vacuum sealer,Hot melt gule gun, Hot air gun,Foot Pedal Impulse Sealer factory. Includes hand impulse heat sealer,Mini Vacuum sealer,Foot Pedal Impulse Sealer,food Vacuum Sealer,Plastic impulse sealer,Manual impulse sealer,Iron hand impulse sealer,foot impulse sealer,Electric Impulse Heat Sealer,aluminium Impulse Heat Sealer,Double foot Impulse Heat Sealer, Single heat impulse sealer,Manual impulse sealer, Plastic hand impulse sealer,Iron hand impulse sealer,Foot Pedal Impulse Sealer ,PDouble edals impulse heat sealer,single Pedals impulse heat sealer,Home Food Fresh Vacuum Sealer,Household vacuum food fresh sealer,hot air heat gun from china.